Phoenix Contact introduces low wattage power supplies to the QUINT POWER premium product line. The newest members of this family deliver ultra-high reliability in a new compact housing design. The low wattage devices feature maximum functionality with a diverse list of application-worthy benefits and accommodate critical applications utilizing the advanced technology of QUINT POWER. Like the higher power QUINT POWER devices, these additional power supplies highlight the robust dynamic power reserve. The dynamic power boost provides the capability to reliably start inductive loads with up to 200 percent the nominal current for up to 5 seconds. The 30 W and 60 W device options also include a continuous static power boost of up to 125 percent of the nominal current. All of the new QUINT POWER low wattage variants are NEC Class 2 classified. For the first time, power supplies in the power range from 30 W to 100 W can offer advanced functionality and capabilities such as a powerful dynamic boost and preventative function monitoring. The new QUINT POWER low wattage additions are designed for critical applications that may have spacing limitations. The compact housing and elite features provide innovative opportunities for analytical and strategic applications. 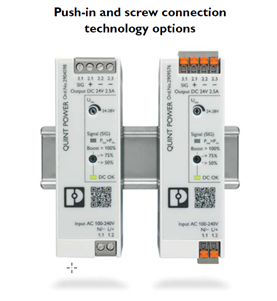 These newest members of the QUINT POWER family are also available with either push-in or screw connections for easy installation. The following part numbers are available. Please visit the Phoenix Contact product catalog on power.sager.com for price and inventory availability. Visit the Phoenix Contact page on power.sager.com for more information on their offering or contact a Sager Power Systems representative, the Authorized Distributor for Phoenix Contact, at (866) 588-1750 or power@sager.com.